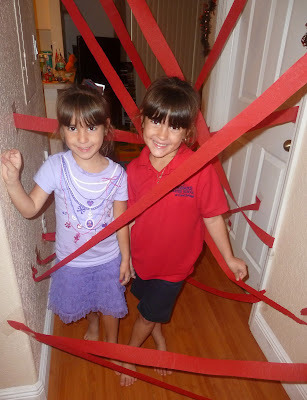 Google+ Mom to 2 Posh Lil Divas: A Spider Web Maze, a Sight Word Game, a Weaving Craft & Writing Fun! A Spider Web Maze, a Sight Word Game, a Weaving Craft & Writing Fun! This spider post is all about FUN! It's a bit long but I waned to fit it all in since we are moving on to our next mini Halloween theme. Honestly, I don't even like spiders and I had such a good time with this mini theme. It really goes to show that making things fun can really make a difference even for the teacher/parent. As soon as I saw this post on Chicken Babies I knew we HAD to have our own spider web maze at home. I instantly knew that the Lil Divas would LOVE it & boy was I right! We don't have a very long hallway (that would have been AWESOME!) so our's was a small web but it was definitely BIG on FUN! Here is the web before the Lil Divas had seen it. 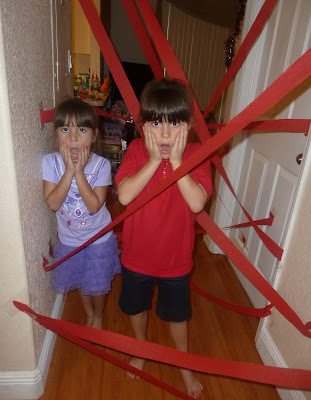 They were banished to their room while I prepared the web - all I told them was that I was working on a surprise. Here is the priceless reaction: PURE GLEE! Making their way through with huge smiles on their faces. Some fancy maneuvering was definitely on display. They had so much fun - I lost count how many times they went through. they were showing shock at having been caught in my web. I LOVE my goofy Lil Divas! I have been working on Color & Number Word recognition w/my Kindergarten Diva. As soon as I saw this inflatable spider in WalMart I had to buy it. I love using inflatables to practice sight words. It combines action (catching & throwing) with reading making it so much more memorable. I simply wrote our target words (colors & numbers 1-10) on index cards that I had cut into 1/4 strips and used mailing tape to stick them on. They can be removed later for different words if desired. The game is super simple. 1. One person throws the inflatable and their partner catches it. 2. Whatever part lands in your hands is what you have to read. 3. Then throw it to your partner and allow them to do the above. I have been dying to break out the goodies we got from craftprojectideas.com. They sent us a box a few weeks ago chock full of crafting supplies including magnets, popsicle sticks, play dough and the ultimate fuzzy kit which we used for this craft. The ultimate fuzzy kit includes pipe cleaners, pom poms and wiggly eyes. Perfect for making some spiders! So that's exactly what we did. Aren't they cute? The Lil divas loved them. Our spiders needed a home & I thought this was a perfect time to get in a little weaving practice. 1. Cut equal strips all around the edge of plate. 2. I attached a piece of yarn to one end. 3. Weave as desired to create a spider web. and our pom pom spiders look so cute in their new home. I am trying to incorporate 1 on 1 writing practice with the Kindergarten Diva into our activities. The only way for her to learn to write properly is to do it and have it modeled correctly. So we sit and work on it together. For this particular writing assignment I had her write facts that she learned about spiders. We also work on handwriting, proper spacing, using the lines correctly and basic grammar (capital letters to begin a sentence and an appropriate end mark). To make it a bit more fun I always let her illustrate what she is writing about. She enjoys drawing so she looks forward to that part. 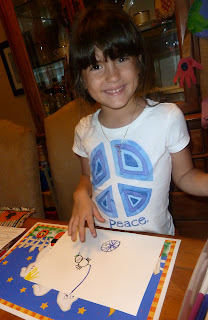 For her spider facts she drew a spider dangling from it's silk, a web, the sun and some grass. Later she decided she needed a fly stuck in the web and a fly near the spiders mouth to show that it was eating. She did a great job incorporating what she learned into her illustration. Her spider had 2 body parts, 8 legs, 8 eyes, fangs and a spinner. If you've missed any of our Spider Fun - be sure to check it out! What great ideas. 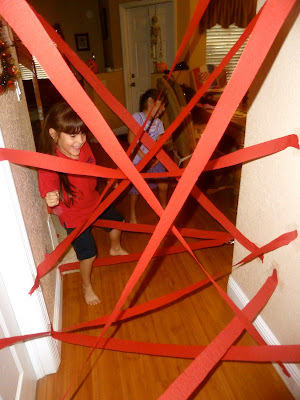 I definitely am going to have to do the spider web maze and my 3 year old will LOVE the Pom Pom Spider and web plate craft. Thanks for the ideas! 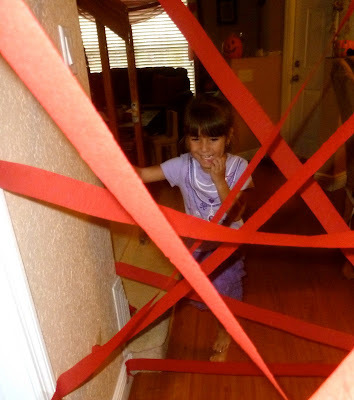 The web maze is wonderful! I love your sight word spider! Your craft is wonderful too. Love this post! So many fun learning ideas. Thanks for sharing. you have the best ideas! I can't wait to try the maze! 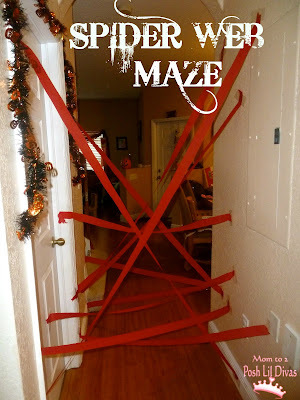 I love love love that spider web maze idea. I just wish we had a decent hallway to do it in. The inflatable spider to work on reading was a great idea too. My girls loved making weaving webs when we did Ww. I didn't have any cute pompoms to make spiders though. Such great ideas. it's like entrapment for kids! love it! thanks for sharing with momstown arts and crafts.